Han Solo, the Bayesian Archaeologist? 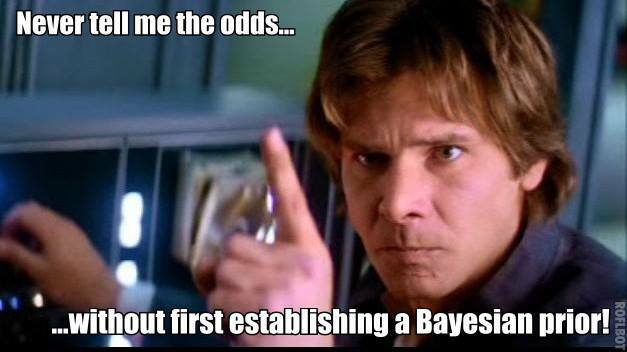 About a week ago on the QUANTARCH FB page Jesse Wolfhagen and I posted R-code to accompany “Count Bayesie’s” excellent introductory example of Bayesian inference using Han Solo. This is a wonderful tool to introduce Bayesian thinking, in everyday language, to everyday people, and to your everyday Archaeologist and Biological Anthropologist. Having the code and Count Bayesie’s awesome narrative apart, as we set them, seemed unfortunate. Reading separately, the concepts are not as easy to follow or replicate on one’s own. In an effort to allow interested individuals to follow along for better understanding and even replicate Bayesie’s analysis, I am retelling Count Bayesie’s example (below in gray block quotes) and interlacing step-by-step R-code to replicate it (eoc/jw code). But let’s be clear, credit for this example goes 100% to Will Kurt, a.k.a. Count Bayesie. To help users follow this example, we also provide flavor of our own. Below the example, we use rjags and rstan to conduct a ‘proper’ Bayesian analyses, via Markov Chain Montecarlo (MCMC) simulations. We hope readers find it helpful. If there are questions, please feel free to contact Jesse or me. In summary Count Bayesie uses a scene from Star Wars to help introduce Bayesian thinking. C3PO: Sir, the possibility of successfully navigating an asteroid field is approximately 3,720 to 1! Here’s the scene for those who haven’t seen it or may have forgotten. Superficially this is just a fun movie dismissing “boring” data analysis, but there’s actually an interesting dilemma here. Even the first time you watch Empire you know that Han can pull it off. But, despite deeply believing that Han will make it through, is C3PO’s analysis wrong? Clearly Han believes it’s dangerous, “They’d have to be crazy to follow us.” None of the pursuing tie fighters make it through, which provides pretty strong evidence that C3PO’s numbers are not off. So what are we missing? What’s missing is that we know Han is a badass! C3PO isn’t wrong, he’s just forgetting to add essential information to his calculation. The question now is: can we find a way to avoid C3PO’s error without dismissing probability entirely as Han proposes? To answer this we’ll have to model how both C3PO thinks and what we believe about Han, then find a method to blend those models. We’ll start by taking apart C3PO’s reasoning. We know C3PO well enough by this point in the film to realize that he’s not just making numbers up. C3PO is fluent in over 6 million forms of communication, and that takes a lot of data to support. We can assume then that he has actual data to back up his claim of “approximately 3,720 to 1”. Because C3PO mentions 1:3720 is the approximate odds of successfully navigating an asteroid field we know that the data he has only gives him enough information to suggest a range of possible rates of success. The Beta distribution is parameterized with an \(\alpha\) (number of times success observed, alpha) and a \(\beta\) (the number of times failure is observed, beta). This distribution tells us which rates of success are most likely given the data we have. We can’t really know what’s in C3PO’s head, but let’s assume that not too many people have actually made it through an asteroid field and in general not that many people try (because it’s crazy!). We’re going to say that C3PO has records of 2 people surviving and 7,440 people ending their trip through the asteroid field in a glorious explosion! Below is a plot of the Probability Density Function that represents C3PO’s belief in the true rate of success when entering an asteroid field. For any ordinary pilot entering an asteroid field this looks bad. In Bayesian terms, C3PO’s estimate of the true rate of success given observed data is referred to as the Likelihood. The problem with C3PO’s analysis is that his data is on all pilots, and Han is far from your average pilot. If we can’t put a number to Han’s “badass” then our analysis is broken, not just because Han makes it (we have p-values to blame for that), but because we believe he’s going to. Statistics is a tool to aid and organize our reasoning and beliefs about the world. If our statistical analysis not only contradicts our reasoning and beliefs but also fails to change them, then something is wrong with our analysis. Why do we believe Han will make it? Because Han makes it through everything that’s happened so far! What makes Han Solo, Han Solo is that no matter how unlikely he is to make it through something he still succeeds! We have a prior belief that Han will survive the asteroid field. The Prior Probability is something that is very controversial for people outside of Bayesian analysis. Many people feel that just “making up” a prior is not objective. This scene from Empire is an object lesson in why it is even more absurd to throw out our prior beliefs. Imagine watching Empire the first time, getting to this scene and having a friend sincerely tell you that “whelp, Han is dead now”. It is worth pointing out again, C3PO is not entirely wrong. If your friend said “whelp, those Tie fighters are dead now”, you would likely chuckle in agreement. han<-not_han # because the values can be the same, it is the PDF parameters that matter, right? The only thing not explicitly stated in this formula is that we usually want to normalize everything so it sums up to 1. It also turns out that combining our two Beta distributions in this way, including the normalization, is remarkably easy. Combining our C3PO belief with our Han-is-badass belief we find that we have a much less extreme position than either of these. Our Posterior belief is a roughly 75% chance of survival, which means we still think Han has a good shot of making it, but we’re much more nervous. We provide code here to used to compute Bayes Theorem including standardizing the numerator (i.e., the product of the likelihood and the prior) by \(P(Data)\). I am going to use Rjags, because it’s easy. Jesse Wolfhagen, of course interjected and provided Rstan code to conduct this much more efficiently. We have both tried to comment the code as best as possible for user replication. Please feel free to contact either one of us if there are questions. To install Rjags, you will need JAGS installed. Please go here to install the appropriate version of JAGS, given your operating system (Windows/Mac/Linux). # more specifically, where does 99% of the posterior probability range? STAN is state-of-the-art Bayesian software (hence the ‘modern’). This is Jesse Wolfhagen’s R and Stan code from QUANTARCH. I EOC made trivial adjustments like adding the Stan model as a text object and pruning here and there, to make the code work in this medium. # if you do not have the following packages, please install them, now. ## Inference for Stan model: 8fb588b48b972555174cee00c8c37ce6. ## post-warmup draws per chain=1000, total post-warmup draws=4000. ## Samples were drawn using NUTS(diag_e) at Mon Feb 12 22:54:52 2018. QUANTARCH Symposium: Call for Abstracts!